Morrisound is located in the Sulphur Springs area of Tampa, close to I-75, I-275 and I-4 and also convenient to Tampa International Airport. The Studio occupies a 1920s-era bank building that has been fully repurposed into a state-of-the-art recording studio complete with an edgy, steampunk attitude. It is just minutes away from many popular restaurants and shops in Tampa’s hottest neighborhood, Seminole Heights. 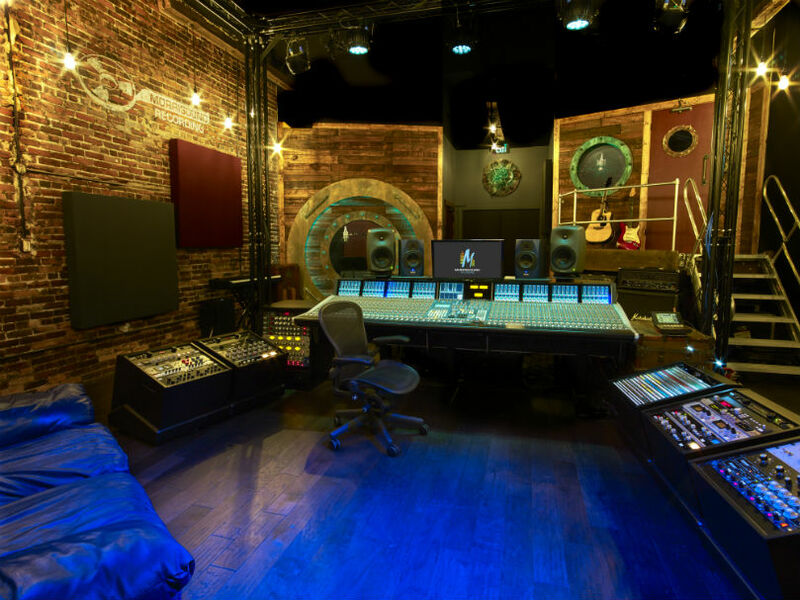 Morrisound continues to evolve with the industry, as is evidenced by the new “Immersive Recording” experience they offer at their new studio space in Sulphur Springs. In the newest iteration of Morrisound, the Producer and Engineer become an integral part of the recording process, and are literally in the middle of all the action. With no control room window to separate them, everyone becomes more a part of the creative process. The end result is melding of technology and artistry that is unmatched in Tampa Bay. Morrisound has been in business since 1981 and has recorded virtually every style of music from quiet string ensembles to heavy rock, with everything in between including jazz, country, gospel, bluegrass, folk, rap, hip-hop, punk, funk, R&B, and death metal, just to name a few. We have also done ADR (dialog replacement) work for major film companies, voice over recordings for TV and Radio ads and narrative recordings for audio books and motivational tapes. Morrisound Recording, Inc. began in June of 1981 as a mobile 8 track analog recording system built into a “Hi Cube” van (not too different from a UPS delivery truck). The original staff included Jim Morris, Tom Morris, Laurel Morris (hence Morrisound) and Rick Miller. After picking a rental location in Tampa with the highest available ceilings, and spending 6 months building and wiring the interior, Morrisound became the first new 24 track facility on the west coast of Florida. Four years after opening the building (in November of 1981), the studio had outgrown the original storefront and moved up to an empty one-acre wooded lot on 56th St. in the north end of Tampa (near the University of South Florida). In November of 1985 the only facility on the west coast of Florida designed solely as an audio recording facility opened for business. Classic albums by artists as diverse as The Dixie Dregs, Death, Chuck Owen and the Jazz Surge, Morbid Angel, Iced Earth, Seven Mary Three, Obituary and many more were recorded in these studios. Many live broadcasts of the nationally syndicated “Rockline” radio show have emanated from that studio featuring such acts as Little Feat, Robert Plant, Ozzy Osborne, The Rembrandts, Third Eye Blind and many others. The 56th St. facility was sold in 2014 to one of Morrisound’s clients as a private practice and recording facility. The decision to sell the 56th St. studios was not an easy one. The plan was to re-imagine what a recording studio could be, and continue making music. The Morris brothers purchased all new equipment, anchored by an SSL Duality console, and “temporarily” set up shop in a private residence to continue their love of recording. Finally, in 2018, after a long search for the right building, they moved into their new home and proudly present the 3rd generation of Morrisound Recording.